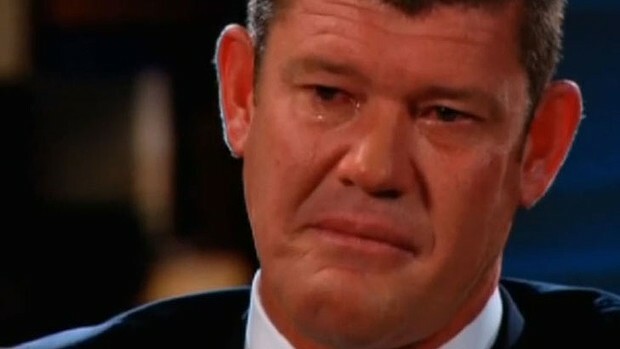 James Packer gives an emotional interview on the Seven network. JAMES Packer says he found his own father 'terrifying' but says in the days before he died he received a 'beautiful call' in which he declared how much he loved his son. ''He said he loved me, he said he was proud of me,'' James Packer said in an emotional interview on Channel Seven's Sunday Night. During the hour-long conversation, Kerry Packer also told his son he should carve his own path in life. ''Twenty-four hours later, his doctor rang me and said, 'Get on a plane, he's only got 24 hours to live','' said Mr Packer, who broke down as he told the story. ''I got home and held his hand and he passed,'' he said. Mr Packer admitted he had found his father ''terrifying''. ''I always got a bit jumpy when dad called because I didn't know if it was going to be a good call or a bad call,'' he said. He said his dad was a firm believer in corporal punishment but he only received a belting a couple of times - and only when he deserved it. While Mr Packer admitted the pair did not have a perfect relationship, it was a ''huge privilege to be his son'', he said. Kerry Packer died of kidney failure on Boxing Day, 2005, aged 68.